International commercial arbitration has become popular in the 21st century and is now one of the most common methods of dispute resolution among multinational corporations. However, as Chief Justice of Singapore Sundaresh Menon has noted, arbitration was never intended to provide a legitimate superstructure to facilitate global commerce. Further, concerns have been expressed over the ability of arbitration to address harmonisation of substantive commercial laws, practices and ethics. Australia has tried very hard to promote itself as a dispute resolution hub, but its geographical location and isolation from the rest of the Asia-Pacific region have impeded this development. 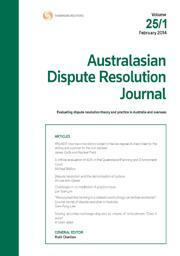 This article discusses the landscape of dispute resolution in Australia and comments on the steps that can be taken to further its position as a “hub”. In particular, it analyses the two recently established international commercial courts in Dubai and Singapore to determine their amenity in the harmonisation of practices and procedures at a global level and their suitability to the Australian system. Mediation in the context of family violence presents numerous challenges arising from complex issues of entrenched power imbalances, safety concerns, risks of retraumatisation and disparities in negotiating strength. However, while mediation will never be appropriate for all families, the evidence strongly suggests that where these issues are addressed and the risks explicitly managed, mediation can be a safe and effective process for many families. Crucial measures to achieve this include proper preparation, risk assessment and management, adequate training and assessment of family dispute resolution practitioners and others involved in the family dispute resolution process, the collaborative use of lawyers and other support people, and referrals to support and education services for parents where necessary. If these challenges are met, mediation has the potential to offer participants a holistic, appropriate and effective process, resulting in durable and workable agreements. The last decade has seen a worldwide increase in the number of unresolved disputes in the international tax arena, with the negative effect of eroding taxpayer confidence in the certainty, fairness and integrity of the tax system, as well as increasing double taxation, thereby acting as a barrier to cross-border trade and investment. Mandatory binding arbitration has repeatedly been advocated as a process that will ensure the resolution of such tax disputes, benefiting both taxpayers and tax administrations. This article examines various recent attempts, mainly by the Organisation for Economic Cooperation and Development, to encourage the widespread adoption of mandatory binding arbitration, and evaluates the obstacles encountered in achieving this aim. References to culture are becoming more common in New Zealand’s dispute resolution statutory regimes. The most recent being, the proposed Te Ture Whenua Māori Bill 2016 (NZ) (the Bill). This welcome development creates challenges for the mediation community. If culture is to be included in these regimes it should translate into effective practice. Otherwise there is a risk of tokenism which could be worse than not including cultural practice at all. To overcome these challenges, the mediator must be sufficiently culturally aware. This begins with self-awareness and education. There is a need for both individual mediators and professional organisations to take a more comprehensive approach to cultural training which will lead to deeper understanding. In practice, a mediator can adapt existing mediation models, use an eclectic approach and utilise different techniques in an effort to effectively incorporate culture. Mediators must be able to maximise inclusiveness and avoid tokenism. Dispute resolution schemes seek to provide a resolution process that is fair, efficient and cost effective. To achieve these goals, those schemes must seek to encourage the early acceptance of fair outcomes by the parties, whether they are negotiated, mediated or arbitrated outcomes. This article considers how parties decide whether to accept an outcome and how that decision can be influenced by the perception of a fair process (the fair process effect). This article concludes with measures that can be implemented by dispute resolution schemes or by parties to a dispute to take maximum advantage of the fair process effect. There is considerable interest in dispute resolution in the financial system, with the existing bodies (the Financial Ombudsman Service, the Credit and Investments Ombudsman and the Superannuation Complaints Tribunal) dealing with more than 40,000 disputes each year. This note summarises the reform recommendations made in the recent report of the panel reviewing the financial system external dispute resolution and complaints framework. The recommendations have been accepted by the Commonwealth Government. The matters dealt with in the note include discussion of the recommendations resulting from concerns about the existence of multiple EDR dispute resolution bodies with overlapping jurisdictions and the need to increase accessibility of the EDR dispute resolution bodies. Expert determination clauses place supreme power in the hands of individuals who have few responsibilities. This article investigates whether such clauses remain robust following recent court challenges and legislative expansion of unfair contract term protections. It concludes that courts could increase access to justice, and reduce the need for expert determination clauses, by more proactively incorporating independent experts into the litigation process. For the PDF version of the table of contents, click here: ADRJ Vol 28 No 3 Contents.